Today’s Thanksgiving and Christmas Party Table inspiration and shopping trip has been compensated. All opinions are mine alone. The winter holidays are my favorite time of the year. Between spending time with family, shopping for gifts an decorating, I get to indulge in my favorite past times. I’m a big fan of guests coming over and enjoy setting the scene for events. Event planning is just as fun as spending time with my guests. Choosing the color scheme and using home decor items to beautifully displayed food and beverages is my happy place. When decorating for Thanksgiving I want to create an atmosphere of comfort for myself and my guests. To do that during the winter holiday, I choose decor that can be used the entire winter. When choosing decor for my Thanksgiving dinner, I brought in pieces with neutral colors from the season. This year, I’ll use many things I already own. This is a good way to reduce cost. 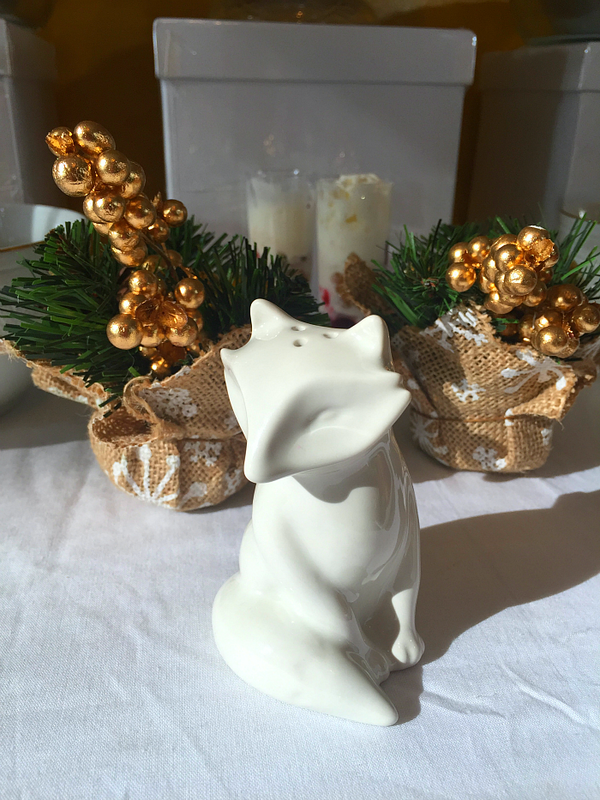 For this dinner I only picked up some faux foliage and this super cute fox salt shaker. For my color scheme I chose colors in the gold and white family. For accent color, I used greens and browns. 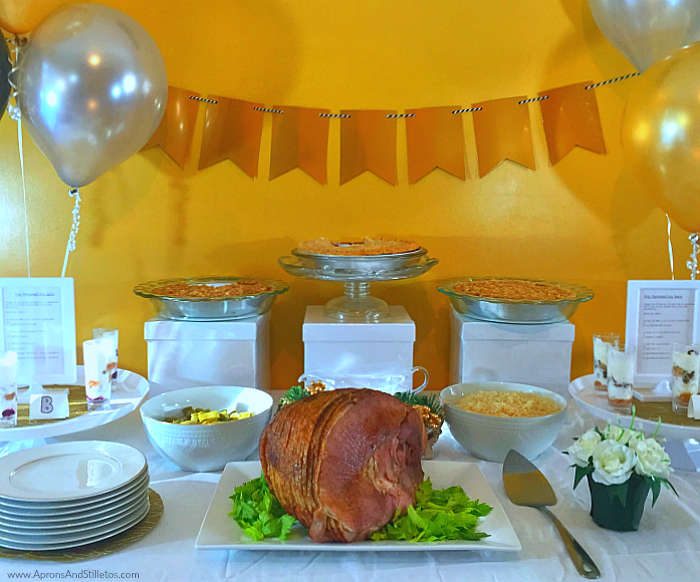 I don’t like overwhelming my holiday table with color, so you will only see hints of golds in my napkins, banner, balloons, and dishes. MAIN COURSE: We will have the same menu for Christmas as we did for Thanksgiving. 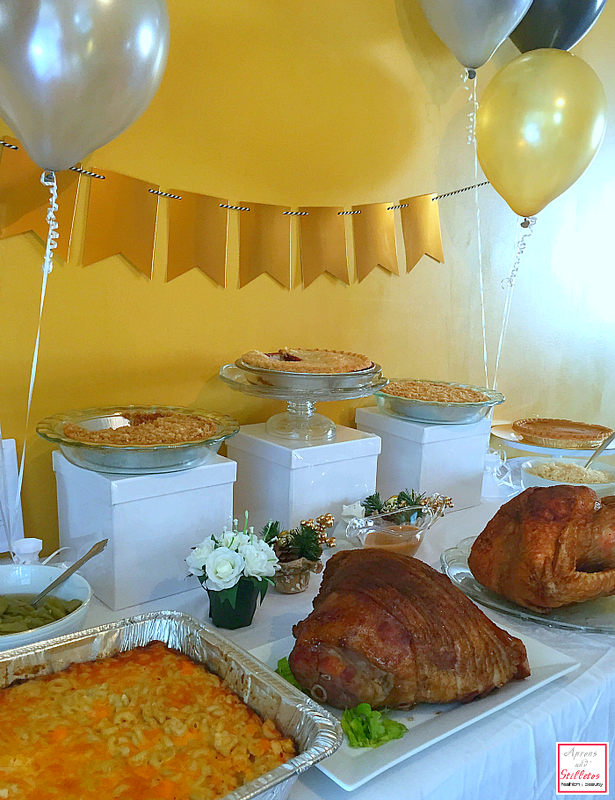 Guest can choose from maple glazed ham, fried turkey, baked macaroni, stuffing, rice and green beans. 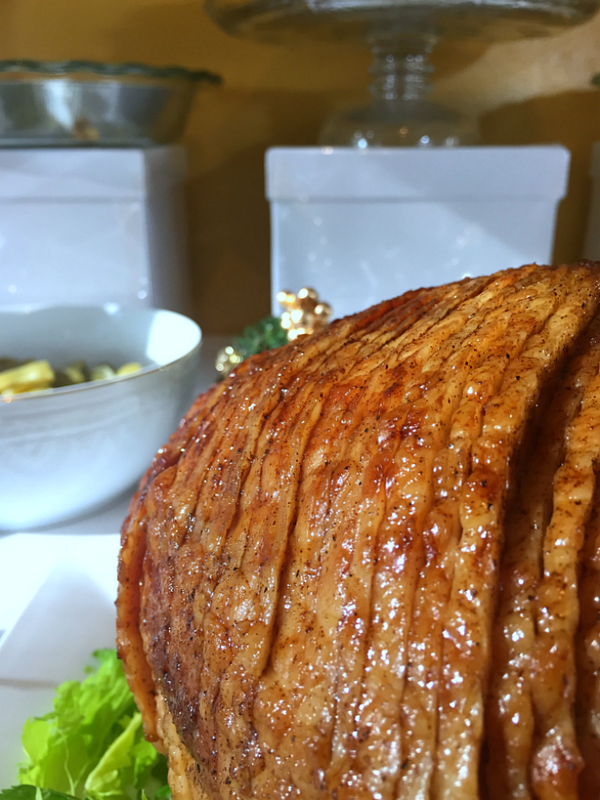 This was the first maple glazed ham I ever cooked and I nailed it. Perfectly glazed and golden brown. For dessert I wanted comfort food, so I chose pie over cake. 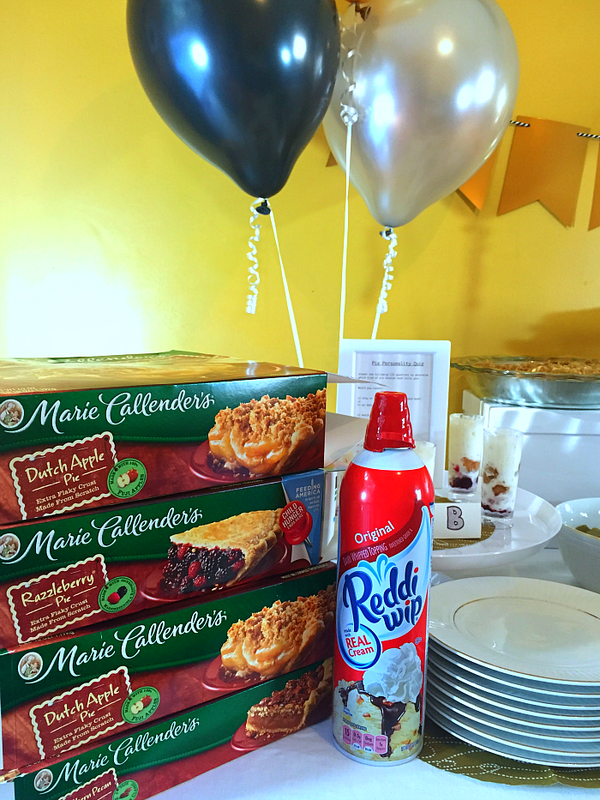 To offer a variety of pie flavors I baked sweet potato pie and bought Marie Callender’s® Dessert Pies in Dutch Apple, Razzleberry, and Southern Pecan. I’d never had the Southern Pecan Pie before, but oh-my-goodness, it’s so good. It’s definitely going to be my store bought go-to holiday pie. There’s no shame in my game. 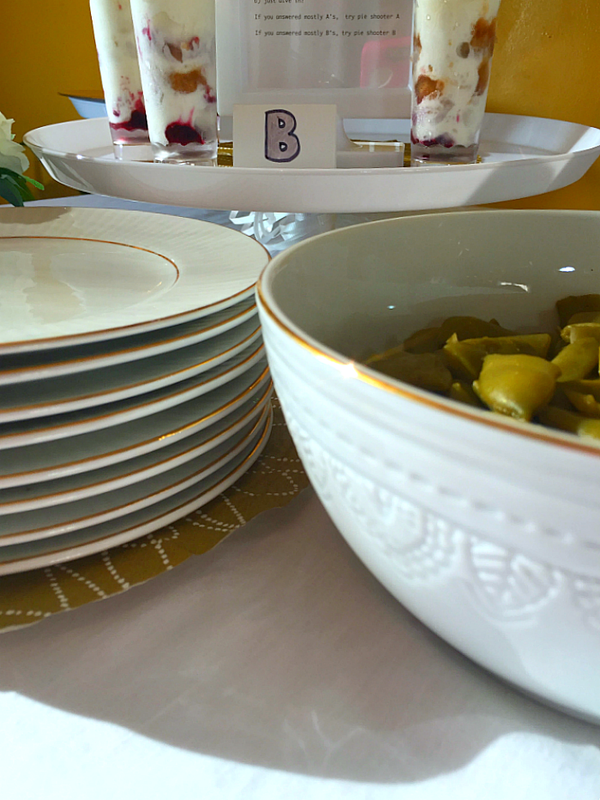 If you’ve used any of my entertaining plans, you know I always incorporate store bought and homemade items as a way to save time. 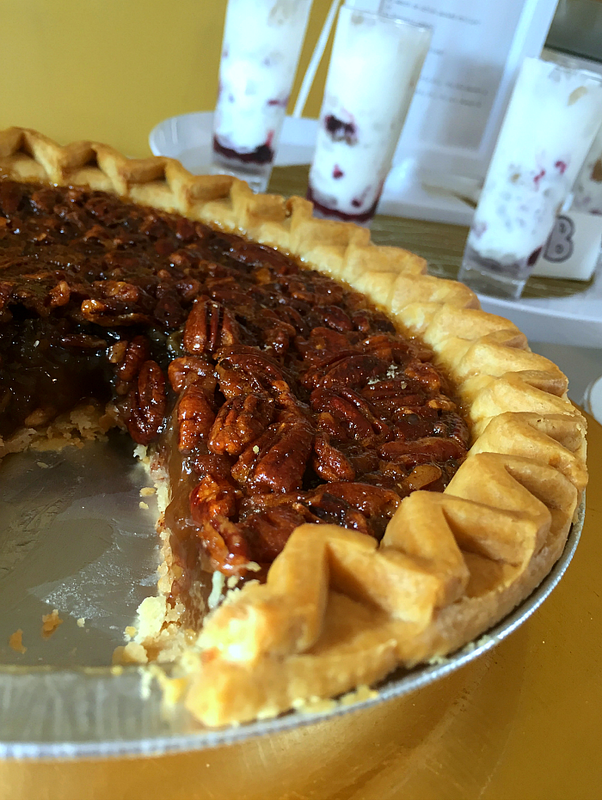 The Southern Pecan Pie is so sweet, gooey and nutty. You want to make sure not to overcook it though. There’s nothing more unappetizing than a burnt pie crust. 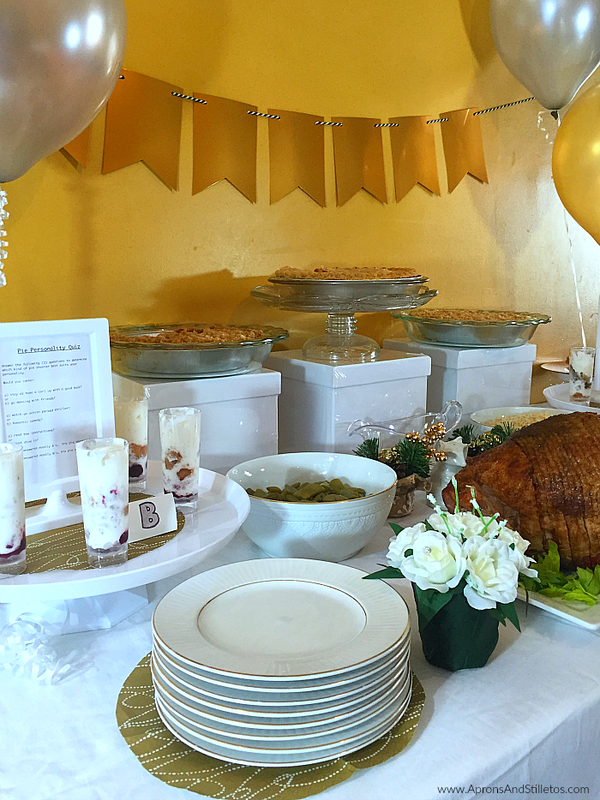 I used white boxes from the craft store to display the pies and the keep them out of the way until everyone had eaten. When guests are in my home, my goal is for them to feel relaxed. I want them to be at ease. To do that, I often incorporate something fun into my events. For Thanksgiving it was a “Pie Personality Quiz“. 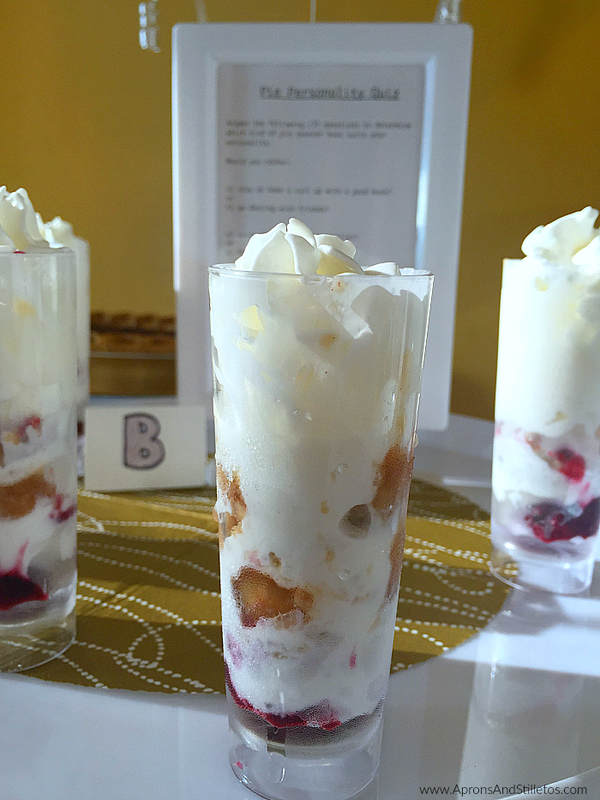 The quiz is a series of questions that lead guest to either tasting the pie shooter in cup “A” or “B”. 1. Add a teaspoon of Marie Callender’s® Dutch Apple Pie to the bottom of the glass. Makes sure you have a little bit of crust, filling and apple. 2. Now, squirt in about a 1/2 teaspoon of Reddi-wip®. 3. Next, a teaspoon of Southern Pecan Pie making sure to incorporate some crust, filling and a pecan. 4. Now, fill the rest of the glass with Reddi-wip®. 5. Place glasses in freezer until ready to serve. 1. Add a teaspoon of Marie Callender’s® Razzleberry Pie to the bottom of the glass making sure to incorporate some crust and filling. 3. Next, a teaspoon of Dutch Apple Pie. Make sure you have a little bit of crust, filling and apple. 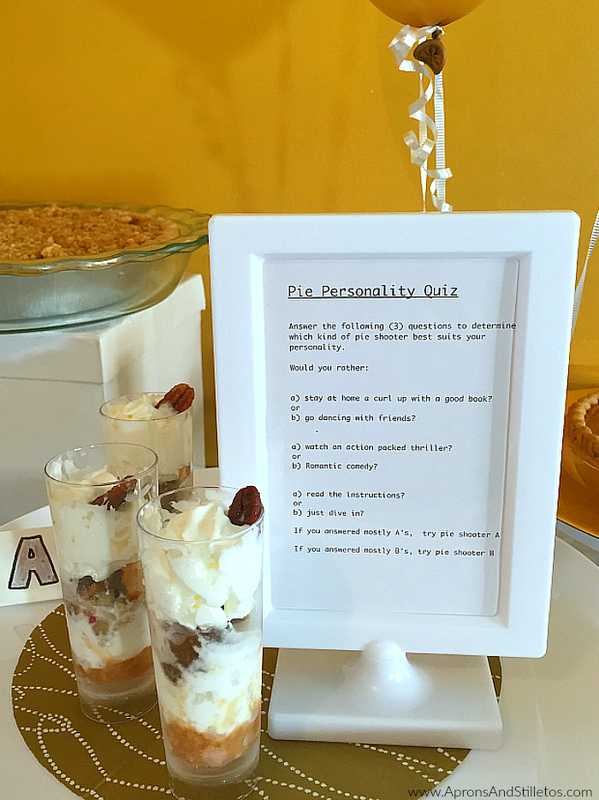 You can create your shooter using any variety of Marie Callender’ pies and then print the Pie Personality Quiz. You can find Marie Callender’s® Dessert Pies at Walmart on the frozen desert aisle or on the end cap. The Reddi-wip® can be found in the refrigerated case on the dairy aisle. Would you like more party planning inspiration? 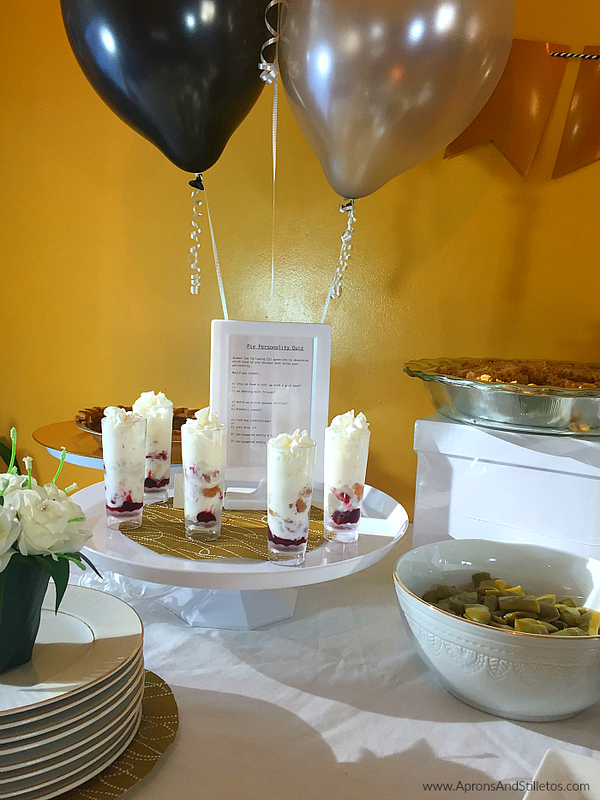 Take a look at some of my other parties for more planning ideas. I do like white as the main color in your table setting. Some colors are too busy for the dinner table. I agree, Marie Callender's pies are delicious. Your table looks lovely. I use my Grandma's dishes for the holidays, they're white with silver. Marie Calender's is my favorite! They make the best pies. Great party! Your table has such clean lines and gorgeous accents! Happy holidays! Your pie cups sound absolutely delicious. And your ham, oh my gosh!!! I'm having that for Christmas. Your table looks amazing. Just the right amount of gold! The pies look great as well. I really like that set up. Adding a touch of red and green would make it perfect for a more stereotypical Christmas look. The pie looks yummy, too! What an awesome set up! I LOVE those pies – we buy them all the time! What a beautiful table set up. The gold theme made it very classy. Wow everything looks so beautiful and yummy! I'd never heard of pie quizzes either. Always learn something new when I visit your site. Very pretty table! I honestly am going to use pretty holiday paper plates and napkins this year to avoid extra dishes. I have trouble pulling everything together– I'm stealing everything in this post. Pie quiz, love it. I am definitely doing both this Christmas…:) Cheers Saidah! you rock your parties as always and we learn some new recipe! That pie!! Yum! beautiful set up.